Down in the most southern tip of Texas, near where the Rio Grande exits out into the Gulf of Mexico, there exists a land where birds of all manner flock. The locals call the area a valley, but in truth, the land surrounding the river is a floodplain, containing many oxbow lakes or resacas formed from pinched-off meanders in earlier courses of the Rio Grande. From the rich soils, farmers grow citrus fruits, sorghum, maize, sugarcane, and cotton. In between these farmlands, government agencies preserved natural habitats for both local and transient creatures. Birds and bugs migrate over this fertile land, along two major routes: the Central Flyway and the Mississippi Flyway. As they make their way through, they take rest in refuges of wilderness set aside by both cities, state, and nation. The result is a collective paradise for the avid birdwatcher. 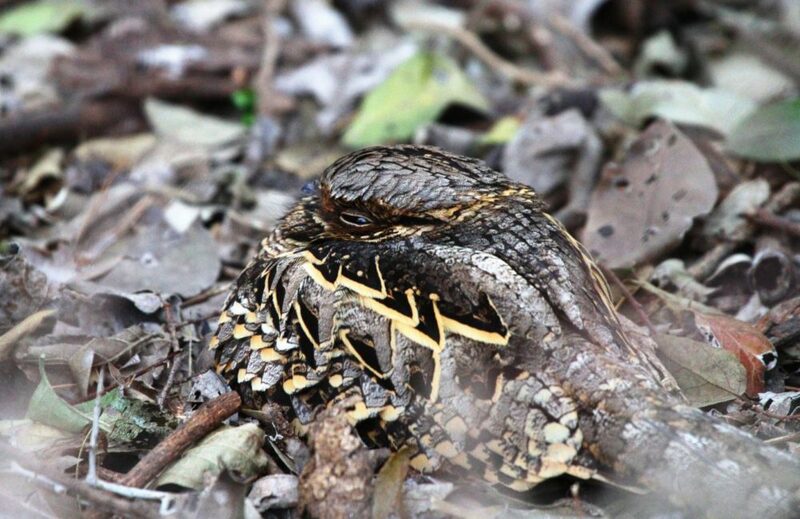 One of top birding spots in the nation, Bentsen-Rio Grande Valley State Park draws birders across to see a treasure trove tropical birds found nowhere else in the United States. Centuries of Rio Grande flooding formed layer upon layer of sediments, forming a rich and fertile alluvial plain. Large growths of Cedar Elm, Sugar Hackberry, Rio Grande Ash, Texas Ebony and Acacia trees create a valuable habitat of intact riparian woodlands along the Rio Grande. Every Sunday & Wednesday morning for about a month, I would join the hike lead by a volunteer or park ranger to spot birds. We would leave the visitor center either by foot or tram. Stops included the Nature Center, the Resaca, the Green Jay Blind, and the Hawk Tower. The Nature Center is where a majority of the bird action happens, thanks in part to the bird feeders. Volunteers are the ones who set out grapefruit, seed, and suet every morning. The volunteers also run the Nature Center itself and are a wealth of knowledge answering any question you have on the park and its inhabitants, avian or otherwise. At the resaca or oxbow lake, where we viewed water birds. From the platform, we saw kingfishers, pelicans, herons, egrets, and plenty of cormorants. Sadly not many waterfowl were found, due to invasive tilapia eating all the underwater plant life. The Green Jay Blind is possibly the best bird blind I’ve seen to date. It’s a permanent structure made of wood viewing slats at various heights that open and close. Here I was able to get intimate shots with various birds and the occasional javelina. During May through October, the best spot for viewing raptors is the Hawk Tower. I was out of raptor season when I visited, and the only birds of prey I saw were stalking smaller birds at the Nature Center. Another place for viewing birds is a 1930’s country estate in the heart of McAllen city: Quinta Mazatlan. This a historic Spanish Revival adobe hacienda is surrounded by lush tropical landscaping. First built in 1935, the estate only changed hands twice before being bought by the City of McAllen in 1998. Today Quinta Mazatlan serves as an urban sanctuary where people can learn about birds, plants, and the environment. Timing is everything at this location — birds can be seen regularly in the morning along with the occasional tropical migrant birds. This is where I saw parakeets, parrots, flycatchers, thrushes, and warblers within a thriving tropical garden with whimsical art installations. Inside the mansion, I also enjoyed the art gallery and the self-guided tour of the house. 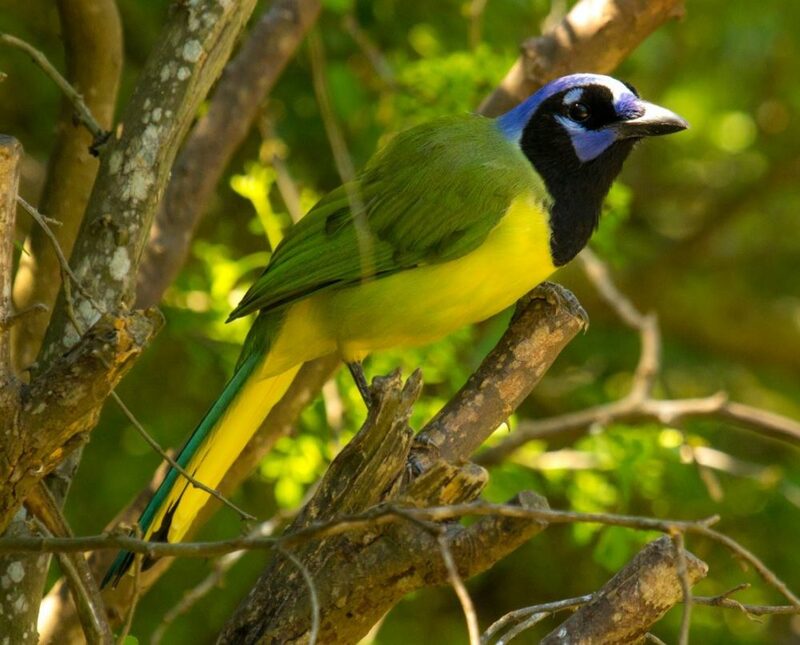 South Padre Island Birding & Nature Center is a magnificent introduction to a rich birding destination. The 50 acres contains Dune meadows, salt marsh, and intertidal flats from which to spot a variety of shorebirds. Also included are thickets of native shrubs and trees that are compelling to migrating birds in their season. 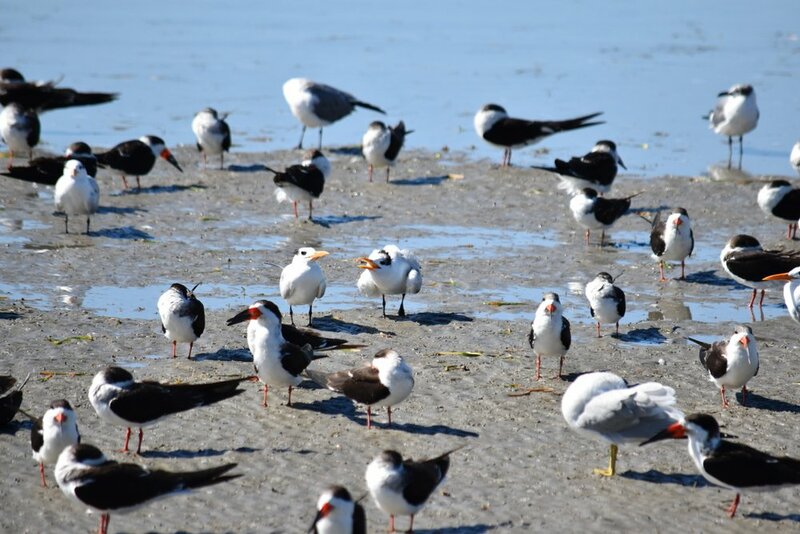 South Padre Island is a crucial first landfall for birds making the strenuous migration across the Gulf. Many of them come from Southern Mexico and northern Central America. If you happen to be on the island after a spring storm, you will be witness to a rainbow of warblers, tanagers, orioles, and thrushes taking shelter in the shrubs and trees, while shorebirds and waterfowl stick to the wetlands and waters. When we visited, we were delighted by the museum, the watchtower and of course the boardwalk which took us among the thickets and shoreline. Birds here felt safe among the humans and didn’t shy away as in most other preserves. I just loved the look of Roseate spoonbills, ibis, and herons, while the terns, gulls, and pipers seem to rule the place. Spanish moss draped on trees and noisy chachalacas within the underbrush are easily found within this U.S. Fish & Wildlife Service managed refuge. In 1943, Santa Ana National Wildlife Refuge was established as a protection for birds due to its ideal location. Surrounded by farmland on three sides and the Rio Grande on the south, this 3 square mile area serves as a juncture for two major migratory routes. Santa Ana also happens to be the northern-most point for many species whose range extends south into Central and South America. When we visited Santa Ana we took the tram tour, which is a nice overview of what the park has to offer. On a later day, we took a quick hike to the bird tower, hanging bridge, and bird blinds. We were told that ocelots and bobcats roam the woods in the early morning or early evening, but we were not lucky enough to spot either. This is where I saw my first set of nighthawks and buntings. Apart from the three places I got to visit, there are also six other locations that we didn’t have time to visit.